This way of creating cluster view maintenance screens is very powerful and allows your users to maintain tables with complex relationships rather easily. The following is a depiction of the data model for our example. First create the 3 database tables with the fields below. Easy. Next up is creating the Maintenance View for each of the tables. Make sure to put the Maintenance Attribute = S in the fields which you need to have carried over to the next screen. E.g. On the header you select order 100000 and you click the lines. You see 100000 on the lines page as read only (see below). 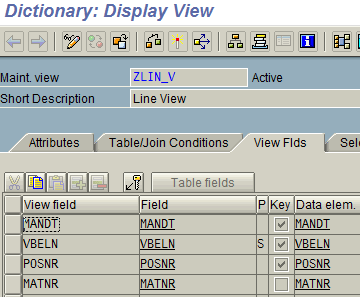 To do this the field VBELN must have an S as it’s maintenance attribute in the Line View. Now take each of the views and generate your table maintenance as per normal. Easy. Now comes the good part. It’s time to create the View Cluster. That wasn't too bad. Now your users can easily update your custom customizing tables.